FAQs | Jasmine Food Corporation Sdn. Bhd. Q1. What is the difference between Brown Rice and White Rice? Brown rice is the whole grain with just the first outer layer (husk or hull) removed through milling. It retains its fiber and germ which contains vital nutrients. White rice is brown rice that has been milled to remove the bran and much of the germ, reducing fiber and nutrient content drastically. The grain is further polished to take away the remaining layer of germ (called the aleurone layer) which contains essential oils. Brown Rice is Rich in Selenium – Extremely high in selenium, an important trace mineral known to drastically reduce our chances of developing certain forms of cancer, as well as heart disease, inflammatory conditions and rheumatoid arthritis. Brown Rice is Very High in Manganese – One cup of brown rice gives us over 80% of our daily manganese requirements. This mineral helps the human body create the important fatty acids that make healthy forms of cholesterol. It is also beneficial to the health of our nervous and reproductive systems. Brown Rice Has Antioxidants – Most people associate antioxidants with blueberries and green tea, but many are unaware that brown rice is also a source of antioxidants. Brown Rice is Very High in Fiber – Studies have correlated the high use of whole grains like brown rice with lowered levels of colon cancer. This may be related to its high fiber content. Studies show that fiber actually attaches to cancer-causing substances and toxins, helping to eliminate them from the body, and keeping them from attaching to the cells in our colon. Brown rice also contains the necessary components to stabilize digestion, prevent/relieve constipation and promote proper elimination/bowel function. Q2. What is parboiled rice? Parboiled rice might sound like it is precooked, but it’s not. Instead, it is processed quite differently from other types of rice. The resulting grain is cooked and served just as you would white or brown rice. However, because of the special processing, parboiled rice is a better source of fiber, calcium, potassium and vitamin B-6 than regular white rice. It is known to be nutritionally similar to brown rice. Q3. Is it bad for our health to consume glutinous rice? Glutinous rice contains high content of amylopectin that have a larger molecular structure. It yields higher amount of calories due to the high amount of glucose which increases the overall blood sugar level in the body. Due to its structure, glutinous rice takes longer time to digest, thus keeping one full for a longer period of time. Brown rice has a higher fibre content compared to white rice. 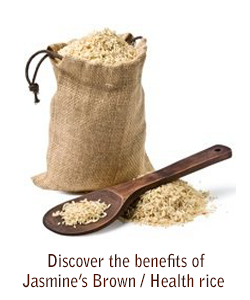 Brown rice promotes early satiety and maintains the feeling of fullness for a longer period of time. Consumption of brown rice will lead to reduced craving for food and is therefore an important component of any healthy dietary regime. Q5. What is basmathi rice? Why is it the healthier choice? Basmathi is a variety of long, slender-grained aromatic rice which is traditionally from the Indian subcontinent. Basmati rice is believed to have been cultivated in the Indian subcontinent for centuries. Basmati is gluten-free and low in fat. It contains all eight essential amino acids, folic acid, and is very low in sodium and has no cholesterol. Basmati has a low to medium glycaemic index, meaning that energy is released at a slower, steadier rate leading to a more balanced level of energy. Q6. Are weevils found in rice harmful? The bugs or weevils commonly found in rice packs are not harmful to human health. The bugs are present in the paddy fields. Bug eggs are deposited onto paddy stalks and are harvested together with the paddy. If weevils develop in the rice pack, simply wash them away during the rinsing process. Alternatively, leave rice under the sun for a while to separate the weevils from the rice. Q7. What is the best way to keep rich fresh? The best way to keep rice fresh (for up to six months) is to keep it in the refrigerator. Otherwise, keep it away from heat and store in a cool dry place.